McLean, VA, 17 May 2013 – ThanksUSA and the U.S. Professional Tennis Association (USPTA) are gearing up for their second annual Tennis Thanks the Troops fundraising campaign to support scholarships for the children and spouses of U.S. service men and women. With May recognized nationally as Military Appreciation Month, the two organizations will be recruiting the country’s USPTA Professionals, clubs, players and tennis fans in organizing tournaments and other special events to raise funds throughout Memorial Day weekend. Tennis stars Lisa Raymond and Mike and Bob Bryan have returned for a second year to support the effort by participating in public service announcements promoting Tennis Thanks the Troops. ThanksUSA provides need-based, post-secondary scholarships to the children and spouses of active-duty personnel across all the Armed Forces, the National Guard and Reserves, as well as families of the fallen and wounded. “Clubs with USPTA pros are developing creative events that will help ThanksUSA award 500 scholarships worth $1.5 million this year, helping make U.S. military families the real winners,” said Michele Stork, executive director of ThanksUSA. Throughout Memorial Day weekend, May 25-27, participating USPTA Professionals at various facilities will collect a minimum voluntary donation of $5 from tennis players, professionals, members, guests and fans to support ThanksUSA. Facilities will have flexibility on their donation-collection options, including choosing among tournaments/contests, lessons and silent auctions, and can also hold fundraising events on other weekends throughout the year. Leading the charge are the San Diego District Tennis Association through its annual Tennis Fest and the Berkeley Hills Country Club in Duluth, Ga., with a Tennis Thanks the Troops Memorial Day Mixer. All participating facilities will be competing to raise the most money for the campaign, with the winner able to send their pro and one guest to the US Open in New York on Aug. 30. For more information on the Tennis Thanks the Troops campaign, visit the Tennis Thanks the Troops webpage. Join the team and show your gratitude to our military men and women and their families! About the USPTA: Founded in 1927, USPTA strives to raise the standards of the tennis profession while promoting greater awareness of the sport. USPTA offers nearly 70 professional benefits to its more than 15,000 members worldwide, including certification and professional development. With more than 300 days of educational opportunities throughout the year, USPTA offers the most comprehensive continuing education program in the tennis industry. 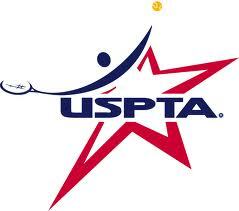 For more information, call 800-877-8248 or visit www.uspta.com. About ThanksUSA: ThanksUSA is a non-partisan, charitable effort to mobilize Americans of all ages to “thank” the men and women of the United States armed forces. The organization provides college, technical and vocational school scholarships for the children and spouses of active-duty status military personnel. For more information, visit www.thanksusa.org. Raise a Racquet in Support of ThanksUSA! 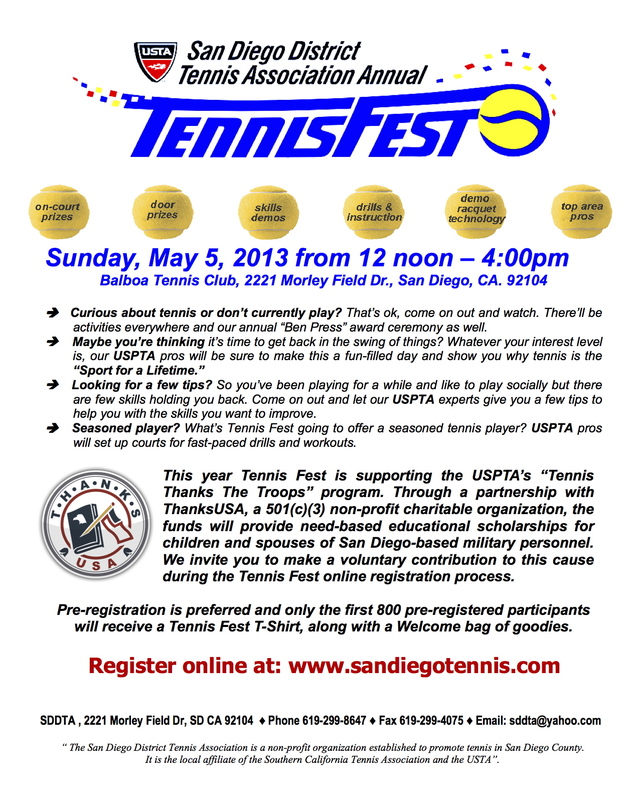 To help ThanksUSA and the USPTA kick off “Tennis Thanks the Troops,” the San Diego District Tennis Association (SDDTA) will hold it’s annual Tennis Fest on Sunday, May 5th. 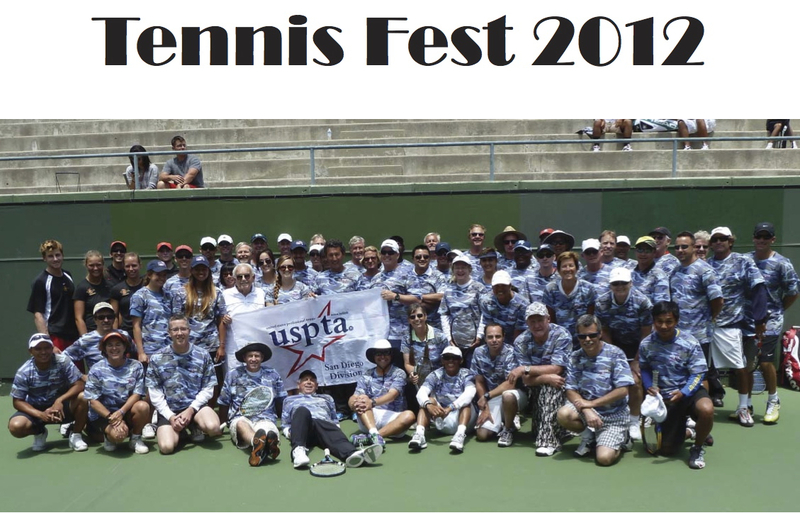 In 2012, USPTA clubs around the country hosted events and collected donations for ThanksUSA scholarships during Tennis Thanks the Troops. Since SDDTA raised the most ($3,350), they were awarded two tickets to the U.S. Open. Always supportive of our military heroes, SDDTA presented the tickets to Wounded Warrior U.S. Marine Corps SGT Lam Le and his wife, Holly.